Heat the vegetable oil in a large frying pan over medium-high heat. Fry the onion and serrano pepper for 2-3 minutes until the onion is translucent. Add the garlic, tomatoes, enchilada sauce, chicken broth, tomato purée, brown sugar and ground cumin. Let the sauce cook over medium heat, stirring occasionally until boiling; season with salt, to taste. Add the shredded pork and let cook for 5 more minutes or until the meat is warm. Remove from heat and let cool slightly. This pork filling can be prepared a day ahead of time and stored in the refrigerator until you’re ready to bake the empanadas. Spray a baking sheet with vegetable-oil cooking spray. To prepare the empanadas, separate each biscuit, cutting the individual pieces in half. Roll each piece of dough out on a floured surface until a 1/4 inch-thick disc has formed. Fill each disc with 3 tablespoons of the shredded pork stuffing. Fold in half and seal the edges closed with a fork. Poke the surface of each empanada 2 or 3 times with a fork. Arrange the empanadas on the baking sheet. Bake for 12-15 minutes or until the dough is golden-brown. Remove from the oven. Serve, and garnish with sour cream. Enjoy! Swap out the shredded pork with 1 lb of cooked, ground pork. Empanadas are a delicious dinner option. They’re easy to prepare and everyone loves that they can eat them with their hands. 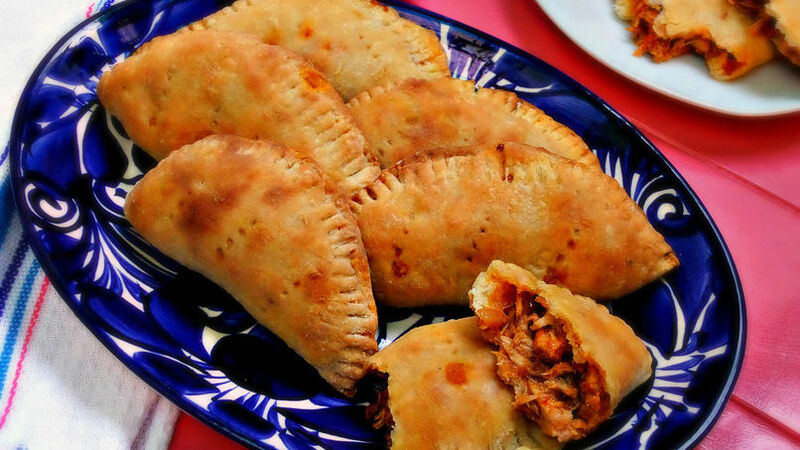 Filled with this easy pork chili, made with leftover barbecued or grilled pork, these empanadas are perfect for casual dinner plans and to accompany your favorite movie or soccer game.